Since founding the Mount Hood National Park Campaign in 2004, I have published an annual scenic calendar that features my best photos of “our next national park” taken during the course of the previous year. While there are familiar spots featured each year, I also include lesser-known scenes, and a number of secret locations that you won’t find in other calendars, and further illustrate why Mount Hood needs more protection. 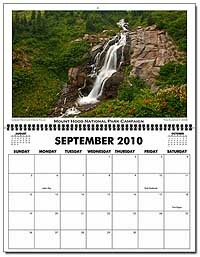 The 2010 calendar features Elk Cove on the cover, photographed early last August on my annual pilgrimage, during the peak of the summer wildflower show. The snowy January scene was captured on a snowshoe trip up the White River last winter. February’s image is also wintry, with a frozen Rock Cove in the foreground, and the snowy, white cliffs on the Oregon side of the Columbia Gorge rising above mists in the background, and catching the last bit of evening light. The March scene features the first flowers of the season in the eastern Columbia Gorge, at Rowena Crest. Look closely, and you can pick out both a hiker (and fellow photographer) and a grain barge in the river, far below. The town of Lyle, Washington is in the distance. The April scene features a little-known lily pond near Cascade Locks in brilliant shades of vibrant spring green. The May image is another lesser-known spot, the Mazama Tarn. This tranquil pond is located on the northwest side of Mount Hood, and for some reason, rarely photographed. June takes us back to the Columbia Gorge, with a golden-hued sunset as viewed from the bluffs above Mosier. The July and August images are both from the McNeil Point area, first at the reflective McNeil Tarn, then higher up on the shoulder of Mount Hood, near the Sandy Glacier. The August image was captured on perhaps the most magical visit I have made to this beautiful spot over the years, with a mid-summer coat of snow on the mountain and dramatic clouds blowing in, ahead of another storm. For September, another lesser-known location is pictured — one of several unmapped waterfalls along beautiful Heather Creek, on the southeast shoulder of Mount Hood. Lovely Emerald Falls in the Gorge follows in October, and autumn colors are showing along Gorton Creek in the November scene. The final image for December is a misty morning view of the East Fork Hood River and Mount Hood after a heavy winter snowstorm. 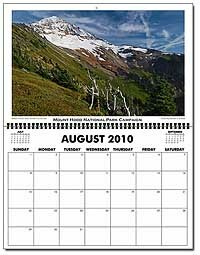 The early Mount Hood National Park calendars were in a smaller format, and thus somewhat forgiving of my photographic efforts. But for the past several years, I’ve used a more popular, oversized 11×17″ format, and the switch has pushed me to assemble a set of images that show off at that larger size. Above all, the images I include are intended to underscore the message: Mount Hood SHOULD be America’s next national park! 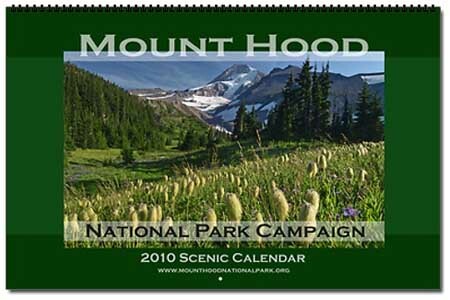 A portion of each calendar sale goes to the Mount Hood National Park Campaign, and I use all of the proceeds to defray costs of maintaining the website, post office box and other logistics. Thanks to all of you who have purchased them over the years, and supported the campaign in the process!